Amid the endless piles of laundry, dishes, forgotten bills, and overdue library books, you have a house. A house you would desperately love to show off with pride. It makes you depressed even to think about how to get this mess organized. You feel your only hope now lies in the chance that one of your horrified relatives will recommend you for a cable show home makeover. While you’re waiting for that lightning bolt to strike, let's try instead some simple steps and ideas to help you make your home into a place that allows cleaning and organization to be easily achievable. Who knows, you might even find the cordless phone you lost months ago! Grab a spiral notebook and a pencil. Take a few minutes and mentally survey each room. In your notebook, jot down the problem areas in the room, putting one problem on a page. You’ll need the rest of the space on that same page for the following steps. The items on the paper should be parts of the room that really bug you, or that your family finds impossible to keep neat. Shoes in piles next to your front door; the table in the entryway piled with mail; the magazine rack overflowing with books, magazines, and pamphlets; the coats, hats, and mittens etc piled in a heap next to the entryway closet. Carefully (but quickly) analyze each room in the house in this way, making a list of the areas that need improvement. Tip: We don’t always see the disorder in these areas until we open them and try to find things. 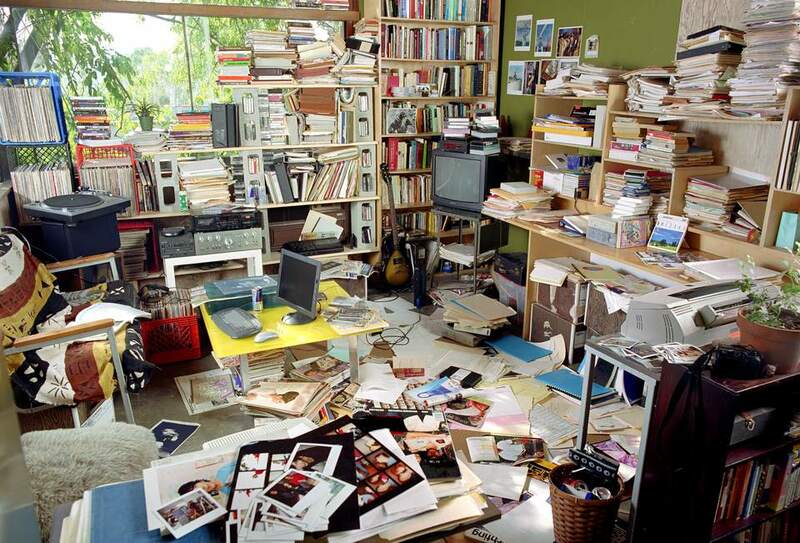 For each of the problem areas in a room, figure out why the disorganization and mess are happening. I find this most easily done if you are actually in the room you are surveying. All answers are acceptable here, including the fact that you live with slobs. Usually, there is more than one reason why an area of your home is continually unorganized. Why are the magazines overflowing? You may realize that you have issues of Good Housekeeping from the 70’s in there, or a magazine you bought only for the fudge praline cake recipe on the cover. Continue this process for each of the problems in the room. Write down the reasons for each problem in your notebook, then move to the next room. When you’re done analyzing all your problem areas go on to Step 3. Now comes the fun part. Let’s find ways we can fix the problems. Think about habits, behaviors, and tools that can make those messes disappear. Do you need some sort of a tool for organization to help your problem? Is the problem a habit that just needs to be enforced and practiced? Is it a combination of storage containers or tools and habits that need to be changed? Many of the problems you will encounter will require organizational tools and behavioral changes. Keep in mind that the best organizing system of shelves, hooks, and labels does no good if it is not utilized. The junk mail is piling up on your table. Do you need a sorter directly on the table? Maybe the person going through the mail initially needs to be responsible for sorting out the junk (which is 98% of the mail at my house). If you have a lot of different people in your home that receive mail, try giving each person in the house their own mail organizer in their rooms. Older children could then be responsible for their own mail, thinning out the piles of paper you have to go through. What about switching your family to automated bill paying? Many utility companies today allow your utility bills to be deducted from your checking account automatically. You may still receive mail concerning receipt of payment, but at least these can be filed easily without worry that you’ll forget to pay. Don’t forget about tools that may aid you in organizing problem areas. What if you put an over-the-door shoe organizer in the entryway closet? Do you need extra coat hooks? Would a bowl on the entry table specifically for keys eliminate the chances of having to dash around the house for 15 minutes in search of them every morning? Try to come up with brainstorm ideas for each problem. Find solutions to the problems that annoy you most. Check the detailed room links on this website and the general links provided to find some solutions. Call your friends and ask them what they do to combat the problem. Enlist your family’s help to find out what would enable them to organize more effectively. If you hold a family meeting where everyone has a voice, you may find that those slovenly family members actually have good ideas. Make decisions about what you are going to try in your own home. Write down the solutions you’ve decided on. If when you went through your home you had only a few problem areas, then you’re lucky and you can probably implement all of your changes immediately. Begin by making a list of the tools needed from your lists of solutions (Step 3). Buy the tools that you need and set them up in their new home. Warning: organizational tools will not help if you don’t use them! You must also start to implement the behavior changes associated with keeping the mess clean. You may need to figure out a way to motivate your family to clean. Force yourself to remember to put your keys in the new bowl. Enlist your family’s help. If they see dad’s keys on the kitchen sink, have them take the keys and put them in the key bowl. You may find that initially, some family members (I’m not naming names) find it annoying that their routine of keeping their things wherever they happen to throw them down is being interrupted. Be patient. The relief of always knowing where these items are will win them over in the end. Keep yourself and your family honest by reviewing the room with your list in hand once a day. It may be best to do this at the same time each day. If it was done right before dinner, the family could then discuss problems or successes over the meal. Have you kept up with the changes needed? Have others? Evaluate yourself daily until the room suddenly seems to have removed itself as the source of your frustration.